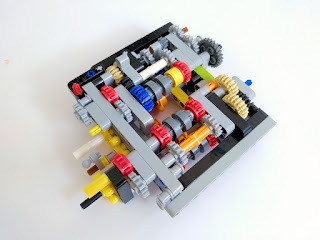 Near the beginning, what is probably to many Technic fans the highlight of the set is built: the gearbox. This is a wonderfully complex assembly, and its compactness is made possible only with the new functional elements, especially the wave selector. 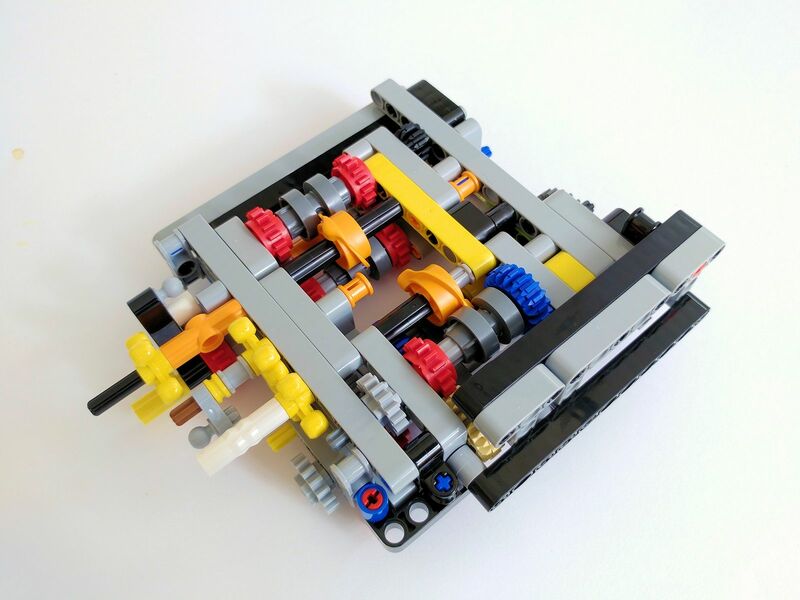 You can see how rotating an axle 90º at a time shifts between all the gears. 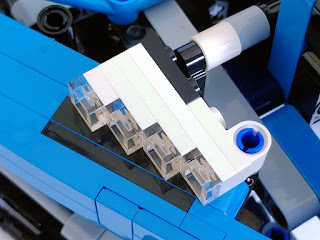 When building this section, it is recommended to pay attention to follow the instructions to the letter – or, in this case, to the image –, as any mistake will be painful to correct later. 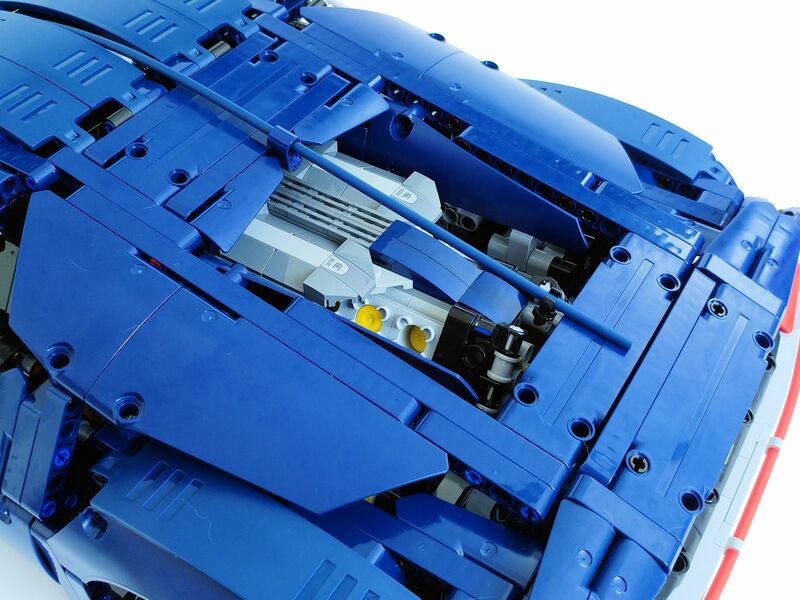 An iconic feature of the Chiron is the W16 engine. 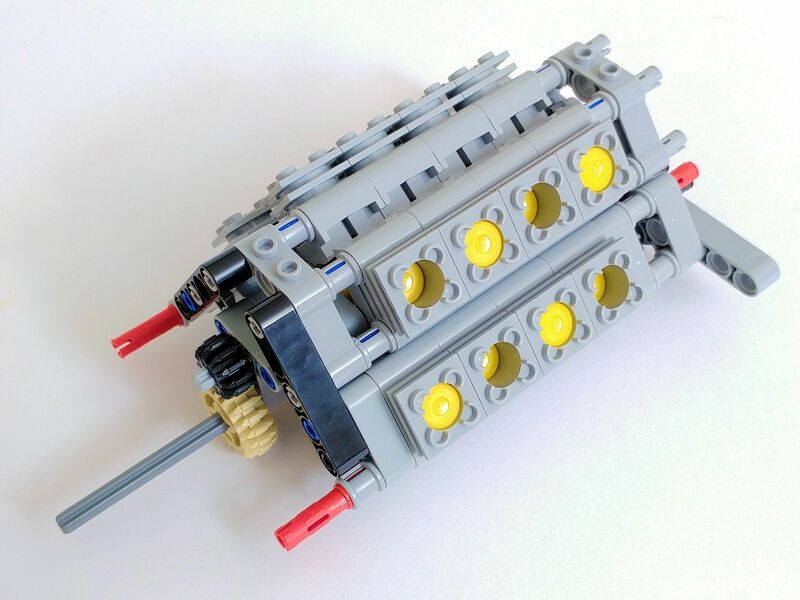 This kind of engine has two blocks of eight interleaved cylinders each, all connected to a single crankshaft. Unfortunately, the LEGO version uses three crankshafts, in reality making it a V8 engine with two L4 engines underneath. 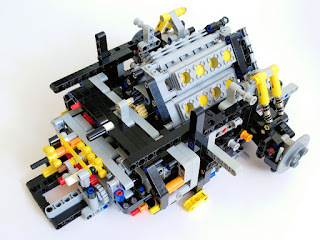 Most likely, making a true LEGO W16 engine would either require a whole sleuth of new moulds, or result in a huge assembly that would never fit in a 1:8 scale model like the 42083. Progression is made from the rear to the front. 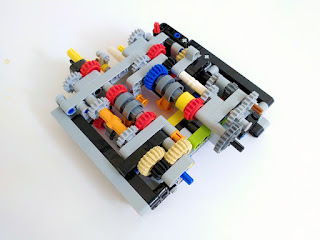 First the rear suspension is built, then the gearbox and the engine are added to it. 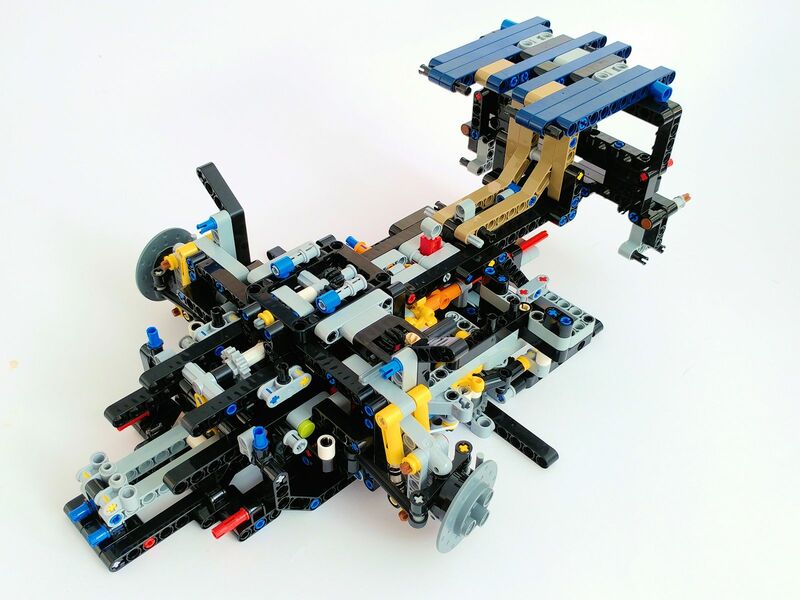 The front suspension and forward/reverse mechanism are built next. 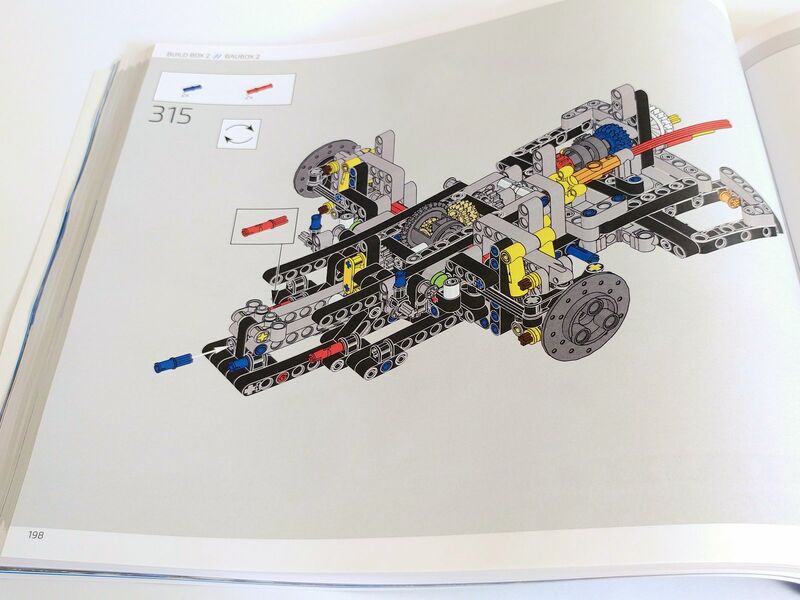 At this point, the instructions appear to have a small error: on page 198, step 315, the orange Technic Pin 3L with Friction Ridges Lengthwise and Stop Bush (Design ID 32054) at the rear is shown completely pushed in, unlike the previous and next steps. However, this error isn't serious and you'll probably not notice it. 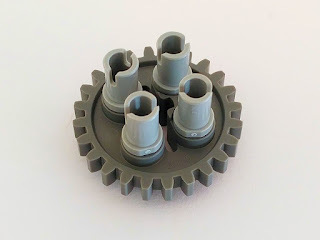 We now come to one of the set's more unusual parts usage: I don't remember ever seeing all four holes of a Gear 24 Tooth (Design ID 3648) used at once in an official set. This assembly is used to make a "stepper" mechanism powered by the gear shifting paddles, which rotates in increments of 90º and drives the gear shifting mechanism. This is a very satisfying "fidget gadget" to use on its own. The front and back of the chassis are joined, and from here it's mainly bodywork, again starting at the rear and progressing forwards. 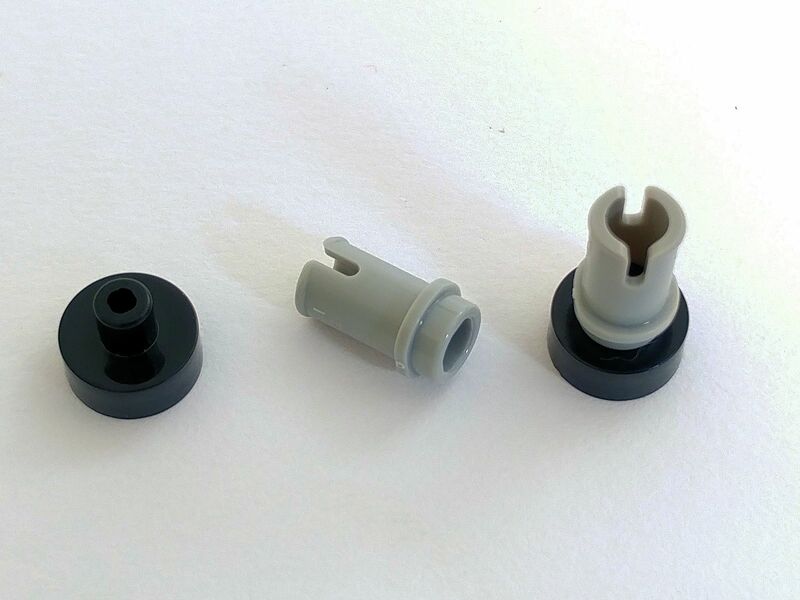 When building the rear details, we come across another unusual part usage: Technic Pins 1/2 (Design ID 4274) are attached to Tiles Round 1 x 1 with Bar and Pin Holder (Design ID 20482) to make what is practically a 1x1 version of the Tile Modified 2 x 2 with Pin (Design ID 2460). These are then used in brick-built details to hold the rear lights. 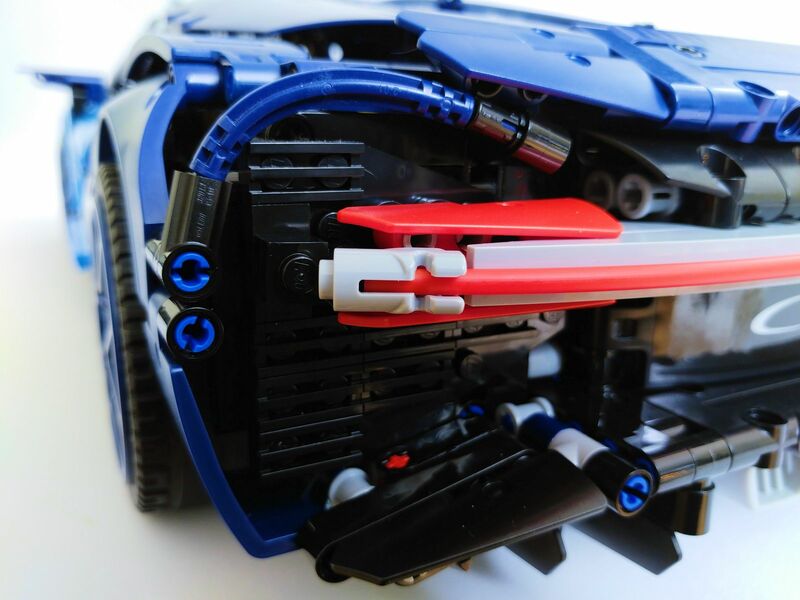 There's one more interesting parts usage at the rear: a pair of Minifig Weapon Guns, Mini Blaster / Shooters (Design ID 15391) hold the ends of the red rigid hose that represents the main rear light. 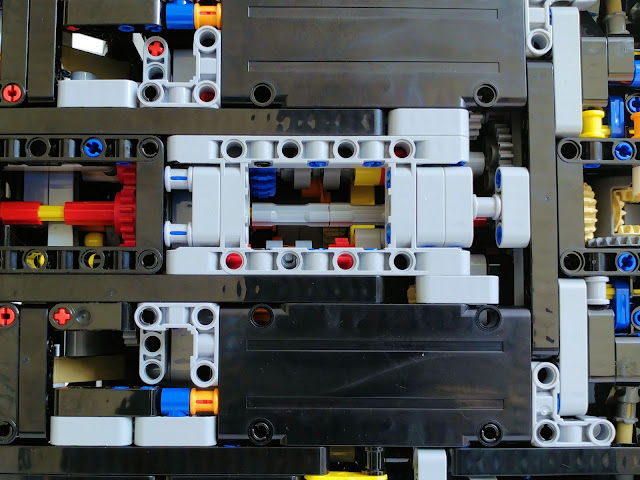 This is an ingenious solution, but unfortunately is also the set's structurally weakest point, as they're very easy to pop off with less careful handling. Reaching the front, more brick-built details are added, most notably the headlights. Strangely these are mounted on while plates instead of black, probably to make them look brighter. Fortunately, what could be an eyesore is well hidden in the finished product. 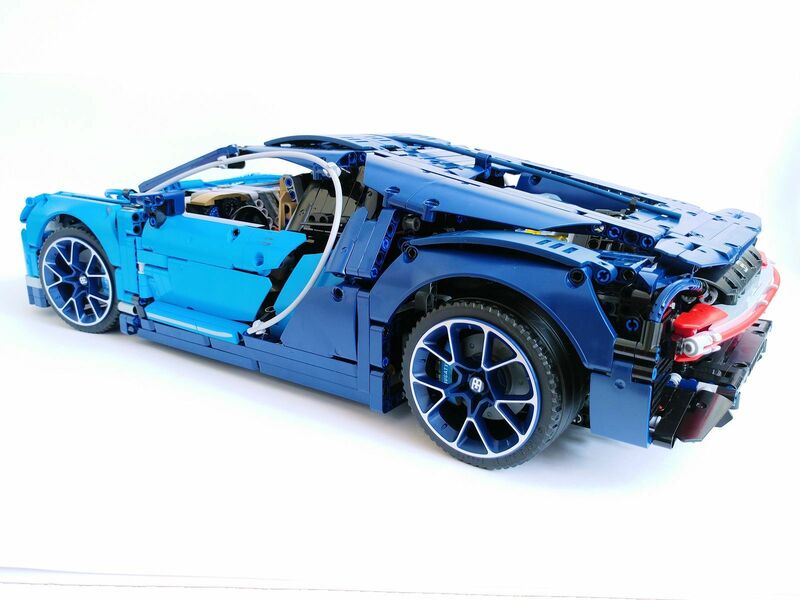 The rest of the bodywork is then built, and after that, all that's left is the final details. The top of the engine is brick-built, as is a Chiron-branded overnight bag to be placed in the luggage compartment at the front of the vehicle. A tool is also built, representing the Chiron's "speed key", which on the real car unlocks its full maximum speed. The Bugatti Chiron isn't my favourite car design, but there's no denying that the LEGO version is a beautiful and faithful rendition of the original. 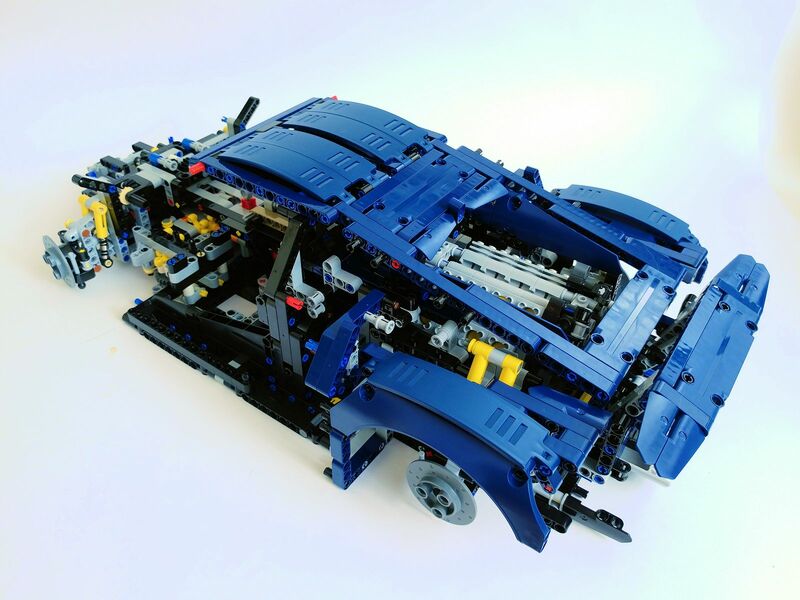 The body elements are assembled in lots of unusual angles, which are required to reproduce the real car's fluid and rounded shapes. The interior is luxurious-looking, built primarily in Sand Yellow [TLG]/ Dark Tan [BL]. 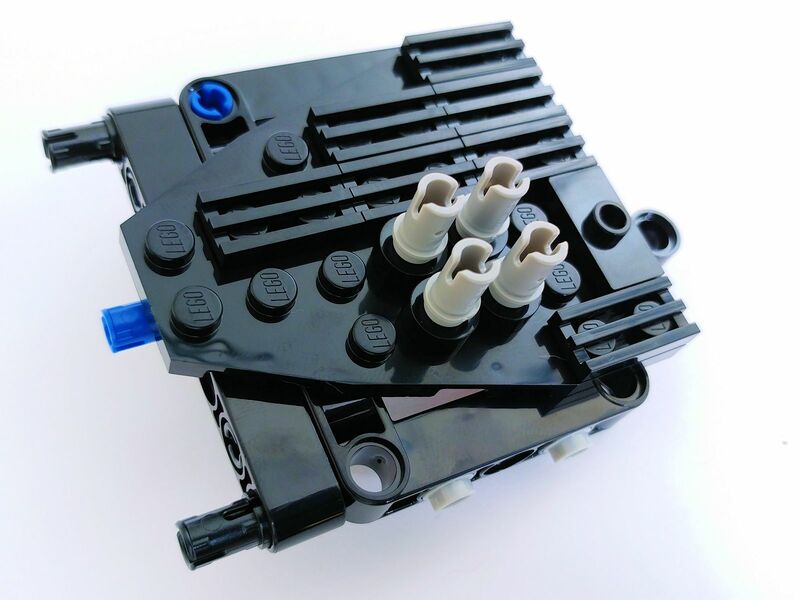 I especially like how Aurélien Rouffiange, the designer, took advantage of the fact that the width of the Technic Pin 3L with Friction Ridges Lengthwise and Center Pin Hole (Design ID 87082) is just a tad less than exactly 1 module, to have four of them arranged in a sloping cascade and reproduce the looks of the real Chiron's centre console. 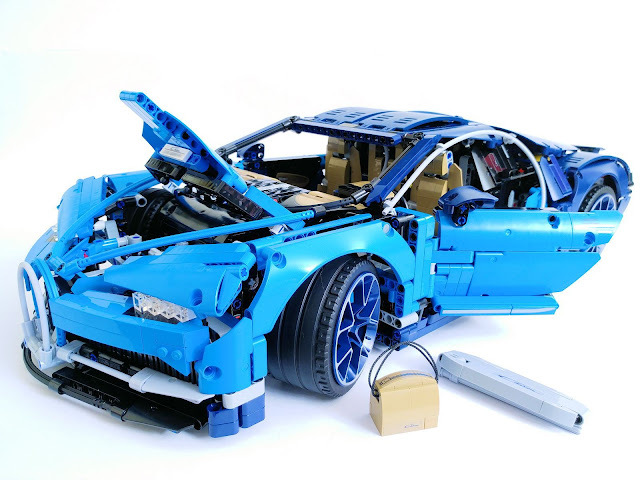 Functionality-wise, the set has much to offer. The doors and bonnet open manually, which in the latter case allows access to the luggage compartment and the tile with the model's unique serial number. 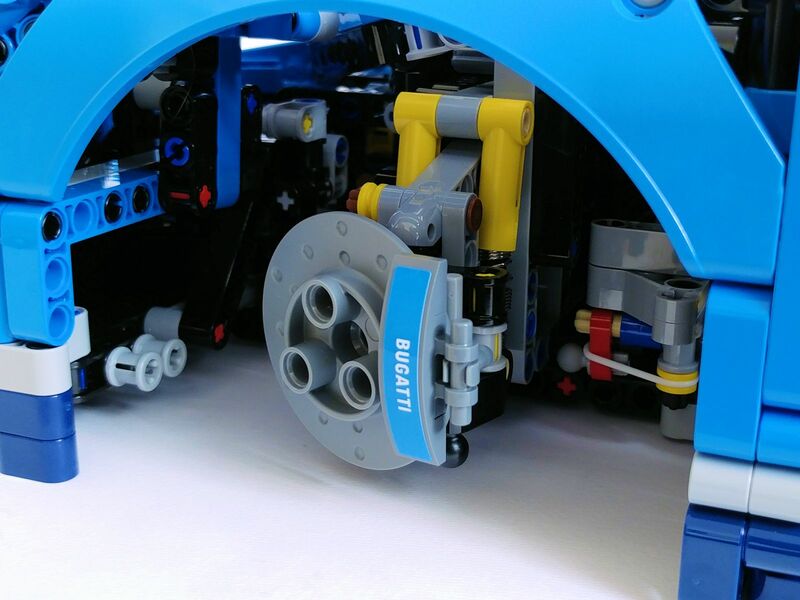 There's functional steering, actuated from the functional steering wheel. Probably to avoid spoiling the model's looks, no Hand of God controls are present on the set. 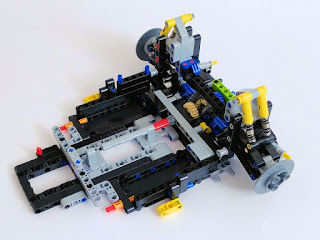 Unfortunately, the turning radius is huge, yet still the left front wheel manages to rub against the gear shift mechanism when turning to the left. 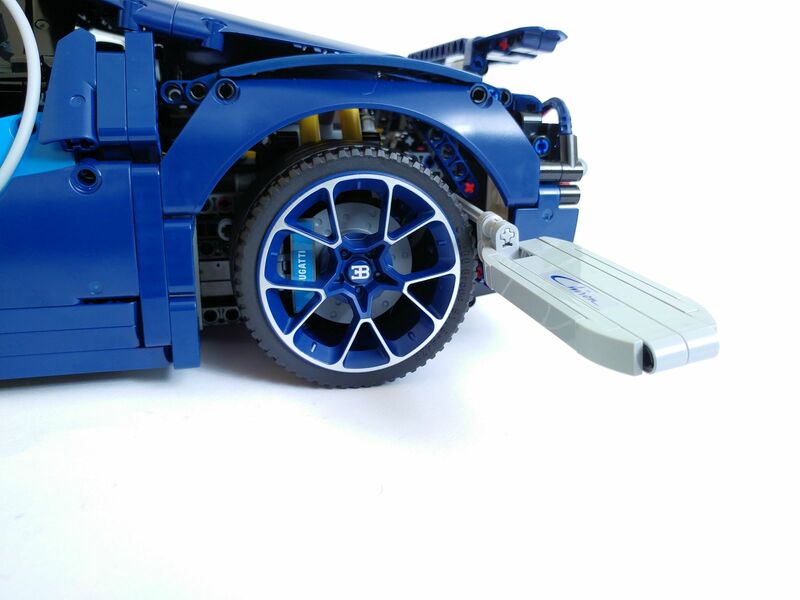 The car features four-wheel independent suspension, each wheel using two Technic Shock Absorbers 6.5L - Hard Spring (Design ID 76537). Unlike the copies in other reviews, such as by Brickset and Sariel, mine does return up when depressed at the front, yet, not fully. 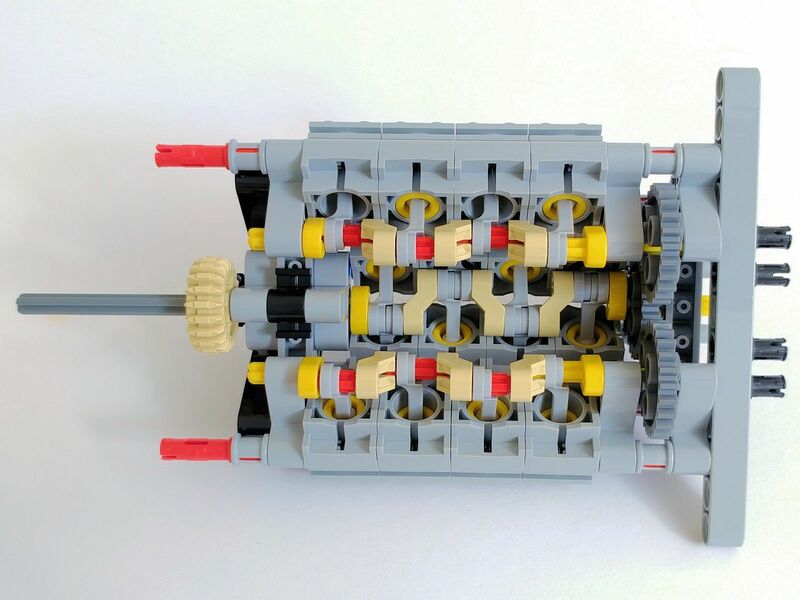 The main feature, however, is the drivetrain. 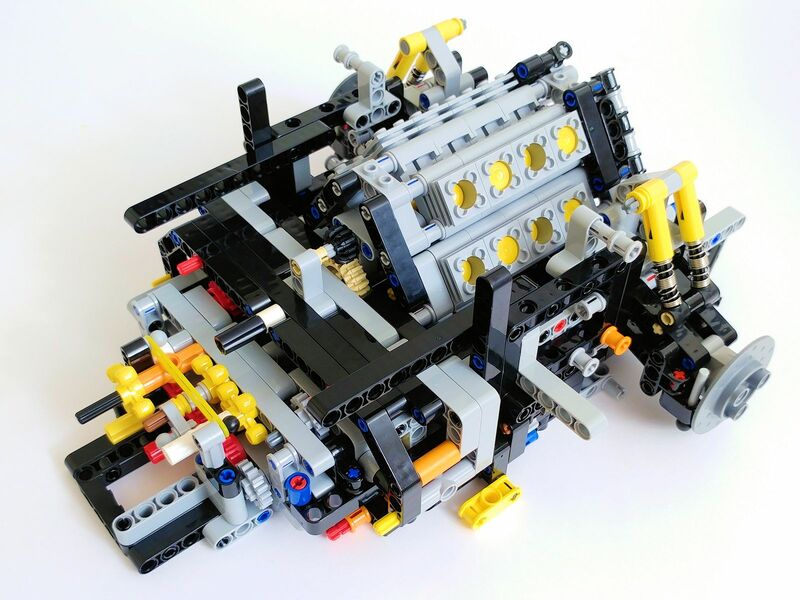 From the W16 engine (whose LEGO version is actually a V8 with two L4s underneath, as we saw) to the four-wheel drive, through the complex gearbox featuring all those lovely new elements. It's unfortunate that most of the gearbox's workings can't be viewed, as it sits between the chassis and the engine; there is, however, a small "window" on the bottom of the car that lets us see the two of the driving rings working. The pistons' movement can also be seen at the top. 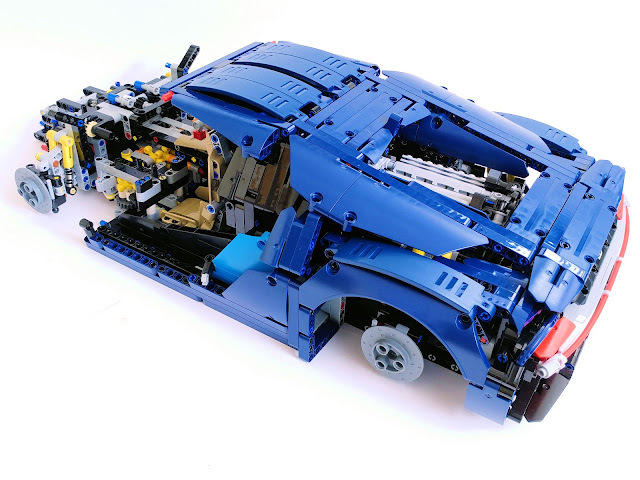 The car has 8 forward speeds and 1 reverse. 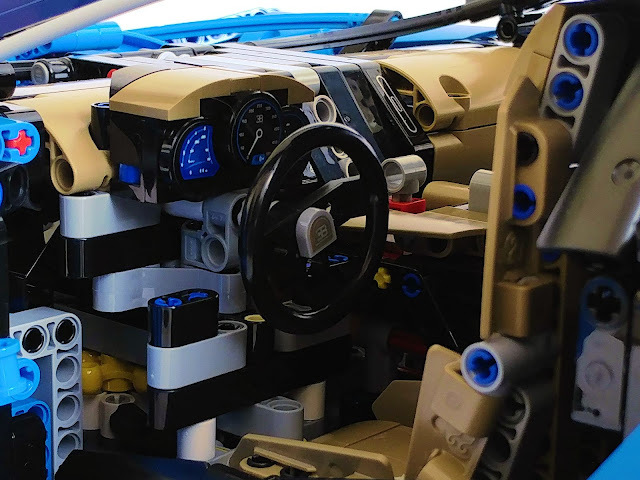 These are controlled from the lever between the seats, which chooses between one of the forward gears or the reverse, and the paddles below the steering wheel, which shift sequentially between the forward speeds. I have two problems with this mechanism, although one of them might be my fault. First, the paddles sit so low and leave so little foot space that they might as well be foot pedals instead. Second, all forward speeds spin extremely slowly in relation to the engine, with no noticeable difference in speed between them, while reverse is quite fast. I might have made a mistake during building, but for the time being don't dare to take almost the entire car apart to verify and fix this. Remember the previous advice about taking care to follow the instructions carefully when building the gearbox? Finally, there's a tool-assisted function. The rear wing can be deployed with the help of the tool shown earlier. 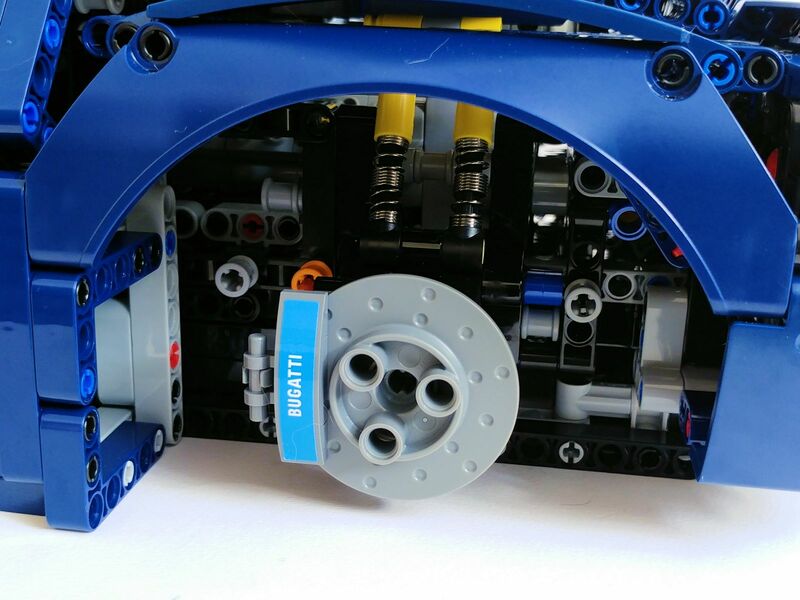 There's a spot behind the rear left wheel where you insert the tool's axle and rotate it, which elevates the wing. 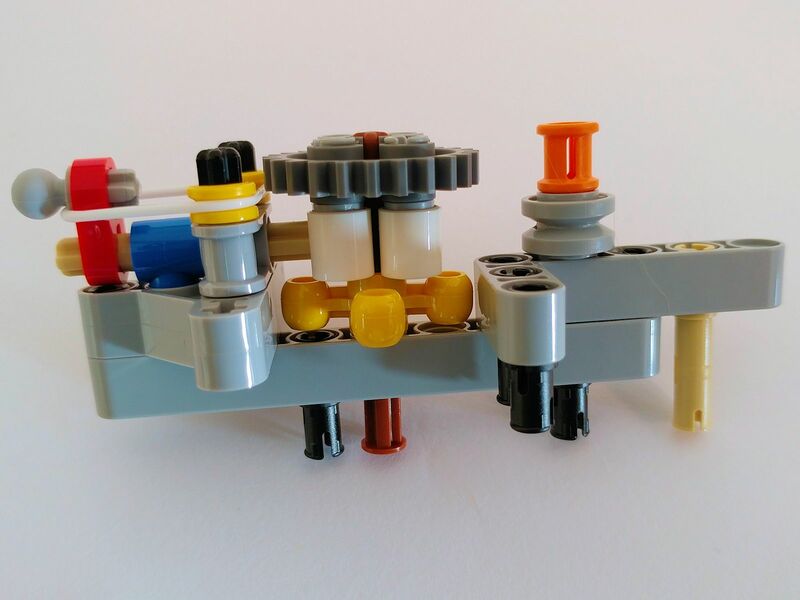 Rotating it more makes the elevated wing tilt forward, to reproduce the real counterpart's air brake functionality. 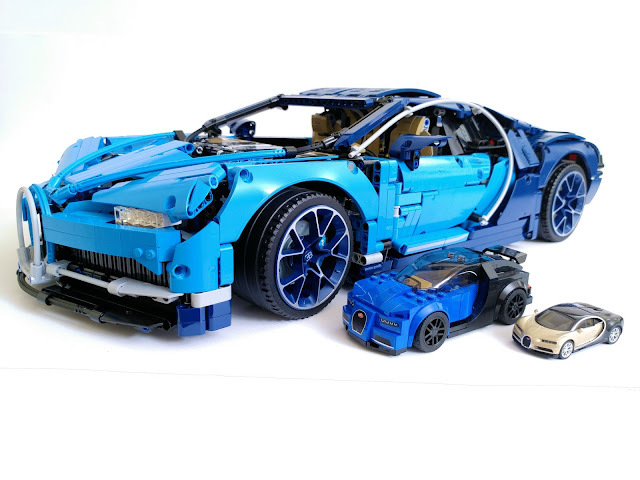 This is an impressive and beautiful set that should appeal to fans of cars in general, not just Bugatti. Technic fans will also appreciate the intricate work involved in having LEGO elements form these complicated shapes, the imaginative use of elements, and especially the complex gearbox. People who like to MOC stuff will also find value in this set, with its plethora of elements in uncommon colours (Dark Blue and Dark Azure) and the gearbox elements, unique at time of writing. On the other hand, this set's hard-to-swallow price tag ($349.99/ £329.99 GBP/ €369.99) is, well, hard to swallow. 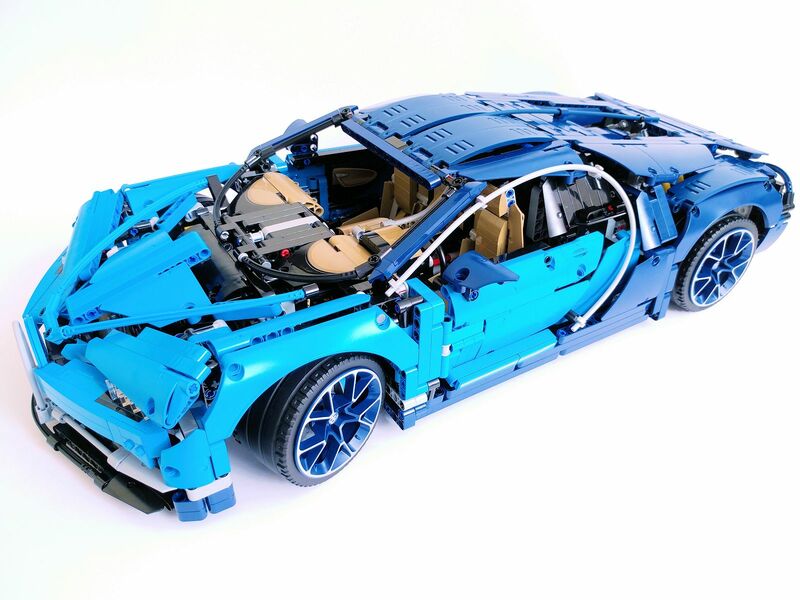 The model's weight of almost 3 Kg (~106 oz), difficulty to steer (both in terms of reaching the steering wheel and the turn radius) and weak suspension, make it unsuitable for playing or modifying for remote control. Also, the subject matter's design itself isn't to everyone's taste. Overall, I'm impressed with this set. 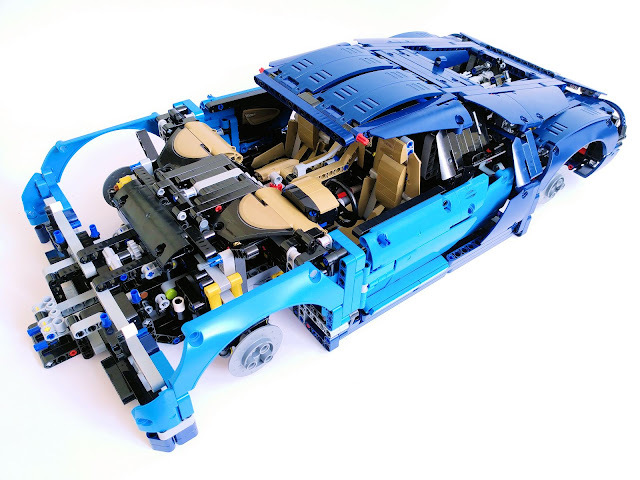 The model is beautiful and ingenious, but, most of all, as a MOCer, I'm personally looking forward to the possibilities offered by the new elements. 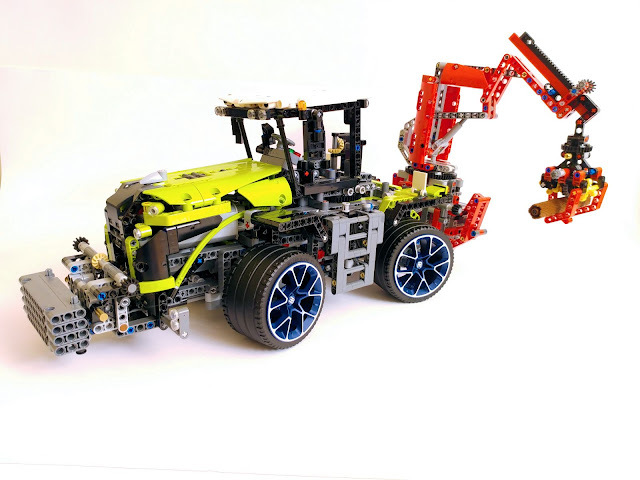 I had on hand one 42054 Claas Xerion 5000 Trac VC, and decided to try swapping wheels between it and the Chiron to see what happened. 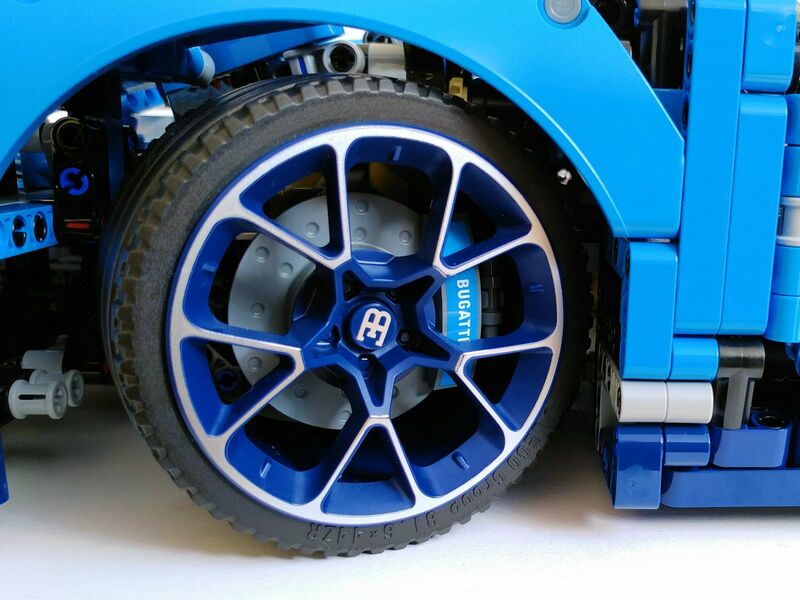 The procedure wasn't 100% successful because the tractor tyres are too big for the Chiron's wheel arches and thus the car can't roll, but still I think the result was interesting. Rich redneck versus snob farmer? 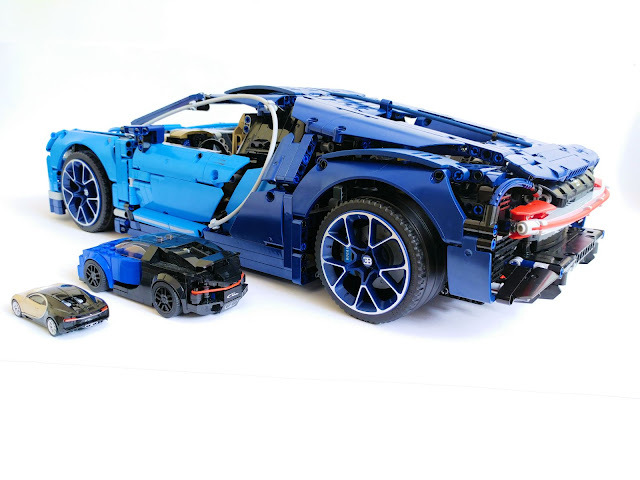 READ MORE: Part 1 of Alexandre's Bugatti Chiron review is all about the parts! 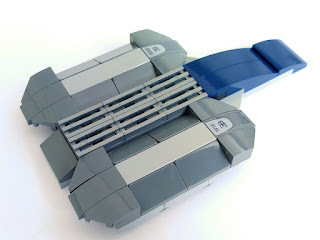 A great review that shows off the parts and techniques very well. I have one nitpick: a sleuth is a detective, a slew is a multitude. Glad I'm not the only person who changes the wheels at the end of a build. Mini cooper wheels on a Ferrari 599 (and vice versa) definitely amused me more than it should have. I just completed the marraige process of the chassis and noticed the same thing about the gearing - namely where I am at reverse is extremely hard to spin , in other words it should result in fast engine spin when fully assembled. Wonder if everyone is seeing that. 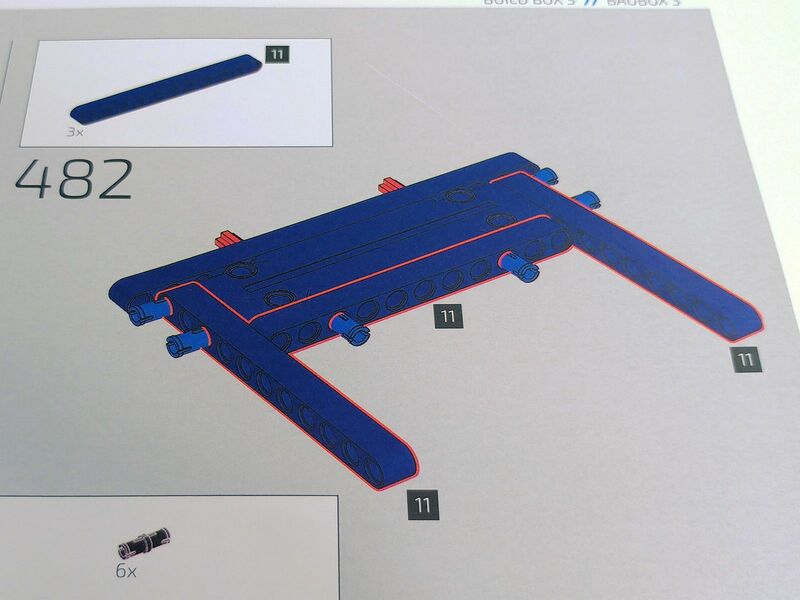 I've just completed the build and have noticed that there are some problems. For one, the front wheels spin opposite to the other. 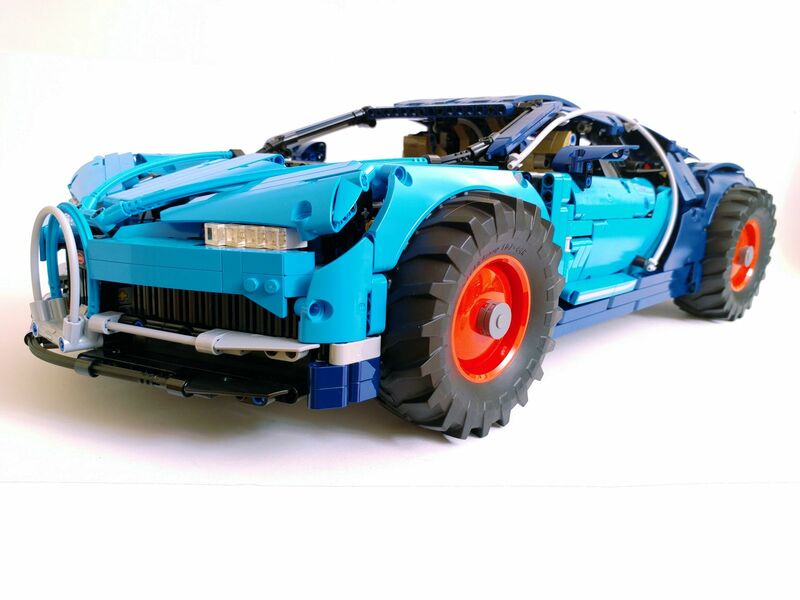 The back wheels don't spin much at all. The lever between the seats don't seem to do anything. I am hoping for some assistance with these (and probably others that I haven't noticed yet) problems. Please and thank you.